British super promoter Eddie Hearn has officially launched a streaming service here in the United States. 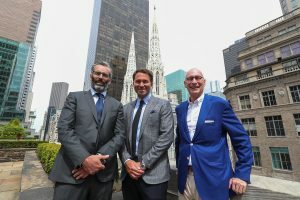 According to the press release: “Matchroom Boxing, a world leading boxing promoter, and Perform Group, the digital leader in global sports media, have today announced the creation of a landmark $1billion joint venture and the biggest-ever deal in boxing.” Matchroom is Hearn’s company and it’s clear he’s making it a major player in US boxing. Hearn announced the deal on Thursday with Perfom Group CEO Simon Denyer. “This is a dream scenario for us,” said Hearn. “We can build a formidable team of fighters and also put our stamp on events from production to talent to in arena experience. Our plan is to make DAZN the home of boxing and with 32 big fight nights already confirmed from the US and UK we are nicely on our way…America – we have well and truly arrived, let the fun begin!” According to the LA Times, Hearn claims he “has $110 million per year to spend on the eight-year deal.” Such a bank account may allow Hearn to bring in the kinds of big American names he hopes to. Denyer claimed that “Perform Group has a rich history of long term strategic partnerships with the best rights holders in world. I’m excited about working with Matchroom; we share the same passion and vision for reigniting boxing in the US and it’s time for DAZN to provide an exciting new platform for these great events. It’s a better deal for everyone – especially fight fans.” Streaming is making a huge impact on the sport of boxing recently. Aside from Hearn’s Matchroom deal, ESPN has recently begun its own streaming service.